Here are some of the apostle Paul’s final words to the churches in Galatia. One question I had when reading this was, why does the apostle use such large letters as he writes? Perhaps Paul’s large letters were the product of an illness that was affecting his ability to see clearly. Or perhaps this was his signature style of writing used to assure his readers that the letter was not a forgery constructed by one of the false teachers. However, I have come to learn that most scholars have agreed that Paul’s true purpose for using large letters was simply for emphasis. So what was he emphasizing? What was so worthy of this added prominence? The answer is the basic principles of the Gospel. And what are these principles? Paul chooses to focus on only two – the Christian faith is inward, not outward and the Christian faith is divine, not human. And what are these principles? Paul chooses to focus on only two – the Christian faith is inward, not outward and the Christian faith is divine, not human. The false teachers were advocating for not only something that was an outward and bodily ritual, but for something that was also a human work. Their “gospel” began with a human work (circumcision) and continued with more human work (obedience to the law). We see this clearly in the book of Acts. So why are these people so insistent on making salvation about human work? Paul says that it is because they wanted to escape persecution for the cross. But how does one escape persecution for the cross by preaching salvation by works? Simple. Preaching morality is far less offensive than preaching the Gospel. The message of morality says, “You can do it, you just need some direction.” The message of the Gospel says, “You will never be able to do it, you need grace.” Look at what John Stott says in regards to this. If you don’t think you’re really that bad, just look to the cross. The cross is God’s personal critique of you and me. It’s important we remember that Jesus didn’t just die, he died a horrible death. Why couldn’t Jesus have simply been beheaded? Why did his death have to be so horrible? It is because we are horrible sinners. 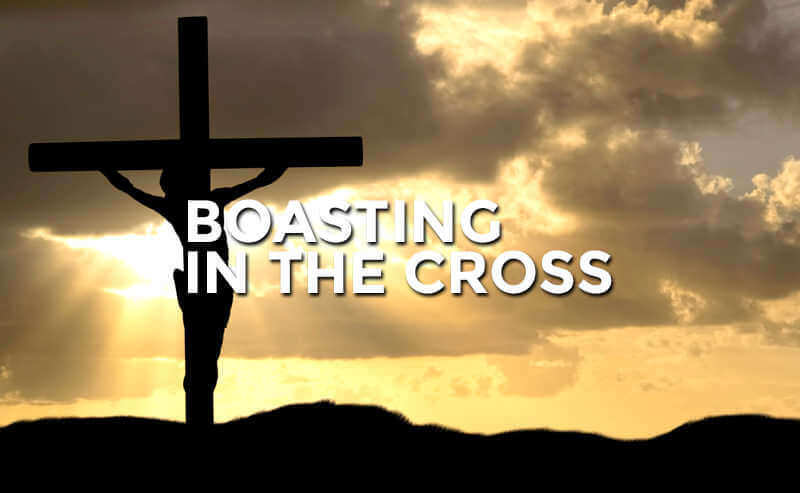 Until we acknowledge this truth we will never be able to fully boast in the cross. It is impossible to boast in both ourselves and the cross because one always cancels out the other. If we aren’t really that bad then Jesus sacrifice wasn’t really necessary. But if the cross really was necessary, then you and I are truly in desperate need of grace. It is impossible to boast in both ourselves and the cross because one always cancels out the other.